Platinum-selling artists Noah Cyrus and MAX have just shared their brand new duet, Team. This song is taken from Cyrus' forthcoming album and is an emotional love song showcasing Cyrus’ softer side. Stream this beautiful love song below! This song and the way everything came together means so much to me. 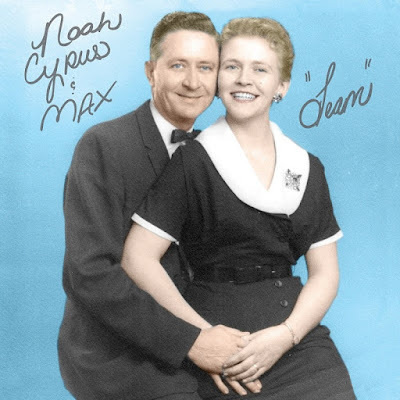 The [single] cover is actually a photo of my grandparents who met on a Monday, got married on Friday and were together for 29 years until my grandpa passed away when my mom was 19. I wrote this song for someone I love very much and my Mammie and Glenmore inspired so much of it. Noah Cyrus, the 18-year old rising pop star, opened for Katy Perry on her U.S. tour and she recently sold out her first Los Angeles show at the Troubadour in mere minutes. She once again made an appearance at Coachella, for the second year in a row, this time joining Alan Walker for All Falls Down. Cyrus’ star began to shine in 2017, as her debut single with Labrinth Make Me (Cry) went straight to #1 on Spotify’s Viral Global Chart within hours of release, and has since surpassed 420 million global audio and video streams. Her follow up songs, Stay Together, Again and We Are… have continued to rack up streams and views and her budding fanbase grows daily. Her forthcoming album is due later this year on RECORDS/Columbia. MAX meanwhile broke into the mainstream scene with the success of his song Gibberish and most recently has found major success with his platinum-selling single, Lights Down Low which reached #1 on Billboard’s Adult Pop Radio Airplay chart, #23 on Billboard's Hot 100 chart and reached top 5 on Top 40 radio. MAX has toured with Fall Out Boy & Wiz Khalifa, opened for Diplo, performed at Lollapalooza, and was listed as one of the top pop stars to watch in 2018 by Billboard.